Take your time and explore the great Kashmere. Start from the perfume of pines in Manali, cross some of the highest road passes in the world and reach Leh, a buddhist pearl in Ladakh. 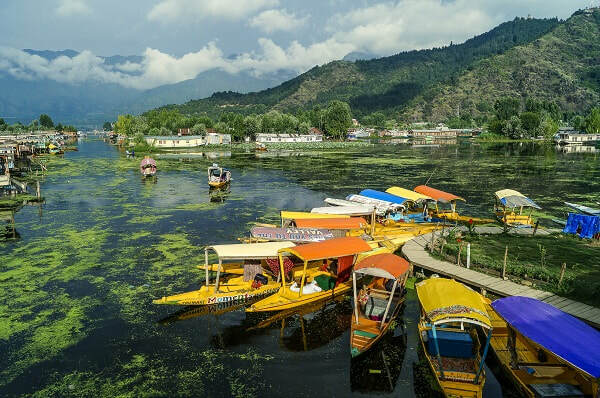 Enjoy temples, great Himalayan valleys and pure nature and reach Srinagar and its beautiful lake. ​Enjoy this 10 Nights / 11 Days tour to discover the real spirit of Kashmere. Leave for Serchu by early Morning, through Rohtang Pass (13050 ft), Lahaul Valley, Tandi, Keylong, Jispa. Lunch break at Darcha. After the Lunch drive to Sarchu through Baralacha Pass (16020 ft). Overnight Hotel. Leave for Leh early morning and cross Nakeel La and Lachung La Pass (16,617 ft.). Lunch break at Pang. After Lunch drive to Leh passing through Skyangchu Thang, the biggest and highest plateau on Earth on stretch of 42 Km. Then cross Tanglang La Pass (17,585 ft) and Indus Valley. Arrive Leh by evening. Overnight Hotel. Free day visiting Shanti-Stupa and the local market, the best place to find all the handcrafts of the region. Day 04: Leh – Pangong Lake. Pangong Lake is situated at 14.500 ft or 4.350 m of altitude. During winter the lake freezes completely, despite being saline water. Day 05: Pangong Lake – Leh. ​A full day of sight seeing in the Indus valey that includes Hemis, Thikse Monastery and Shey Palace. ​​Thikse monastery is affiliated with the Gelug sect of Tibetan Buddhism. It is the largest gompa in central Ladakh, notably containing a separate set of buildings for female renunciates that has been the source of significant recent building and reorganisation. ​We cannot guarantee this proposed audience with an oracle who foretells the future, but if possible we will arrange for you to meet her in a village near Leh. She has such a reputation that local people are afraid to talk to her for fear she will tell them things they would rather not hear. Much of today is free time to be spent doing your own thing. 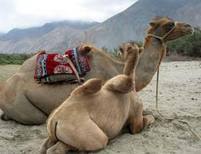 The Bactrian camel is native to the steppes of Central Asia. Day 09: Nubra Valley – Leh. After breakfast visit Basgo Palace, Likir Monastery and Alchi Monastery. Reach Lamayuru for a typical Ladakhi lunch at the restaurant and visit the Lamayuru Monastery, then in the afternoon continue until Kargil. Overnight Hotel or camp. After an early breakfast drive to Srinagar passing through Drass, the second coldest inhabited place on Earth, where you can have spectacular view of Kargil War famous peaks, Tiger Hill and others. Arrive Srinagar by Evening. Fly back home with sweet memories of Ladakh.